You may not be aware, but there’s just a lot of content out there. I know that a groundbreaking thing to say in 2018, but it’s hard to discuss our collective attention without acknowledging that there’s almost no way to focus it. As a former musician, I came up in the height of the MySpace era where getting featured on a popular user’s blog could get you hundreds of thousands of listens and pave the way to tour the country. At this point, I’m not even sure how I find the music I find, or if there’s a single outlet or system that repeatedly opens the door for new artists in the way the internet once functioned. For me, the only surefire line from introduction to fandom for new artists in my life is when I stumble upon their work via games, vinyl releases or a combination of the two. 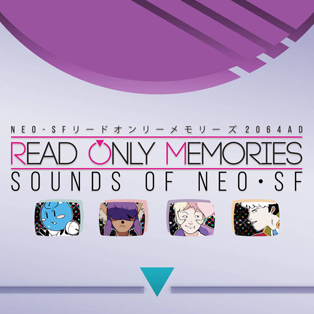 That’s why the extremely limited iam8bit release of the vinyl soundtrack for 2064: Read Only Memories broke 2 Mello into my life. I’ve been obsessed ever since. 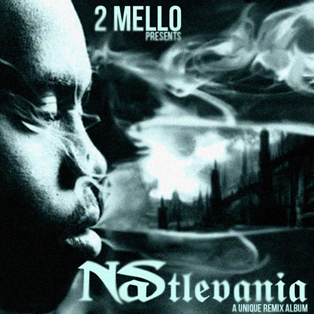 And “Is this happening?” extends into the rest of Mello’s oeuvre. There are albums where the producer harkens back to the Adult Swim bumps of the mid-00s and albums where he just soundtracks lonely but positive night walks. 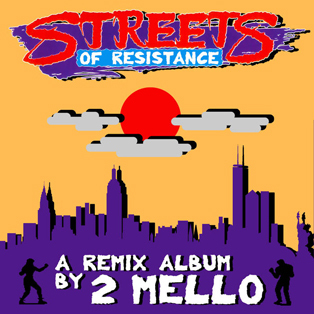 Mello’s latest release isn’t a mash-up album; rather it is a tribute to the video game franchise Jet Set Radio. If you’re not familiar, the series featured a very specific brand of inspirational and rebellious pop dance punk that stirs something between a sense of nostalgia and the desire to do a kick-flip off a fascist. Mello captures that spirit in a project that’s been gestating in his brain for more than a decade, and you can share in it now by grabbing a copy of Memories of Tokyo-To: An Ode to Jet Set Radio. We grabbed a few minutes of Mello’s time to discuss tributes, remixes, games, queer noir and finding success in the infinite expanse of modern internet music. 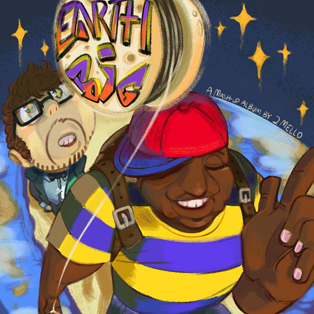 Where does the origin of an Earthbound/Notorious B.I.G. mashup album or any other of your unholy alchemies begin? Do these start as gigantic big picture concepts or tiny song bits? And then, what’s the first step in making it real? At this point, I’ve done enough of these remix albums that I actually do have a formula. There are usually only a certain number of acapellas (vocal-only versions of songs) available for the rap artist who I want to make the main focus. I simply line up all the ones I want to or can use, and then go through the game’s tracks, eliminating anything that I don’t think can be worked into an instrumental remix. Once I have the remaining game tracks, I slowly pair them with the rap vocal tracks and add a lot of love, and an album comes out! It’s harder and more fun when I’m doing various artists and one game, like with my Streets of Rage album. What’s your music production setup? Are there plug-ins you swear by? A cool trick you’d love to share? I use Ableton Live and I have some gear, an AKAI MPD26 and MPK Mini, but honestly. I do most of my work with mouse and keyboard. For my vocals, I have a Rode NT2-A running through a Focusrite Scarlett interface. I believe that Valhalla Vintage Verb is the best reverb plugin that exists, and it is extremely affordable. You can do almost anything with the Native Instruments FM8 synth, and anything you can’t, you can do with Xfer Serum. My number one production trick is layering–backing up sounds with sounds of the same type that bring in what they lack, or enhance them in some way. When done well, this makes things sound more filled-out, more emphatic and more like they’re your own. How long does it take you to put a track together from start to finish? I bounce between making very simple and very complex music these days, and the amount of time it takes me to finish a track is varying wildly, but I would say 10 or 15 hours is a good estimate. That’s for production, writing, recording, mixing and mastering, and that time can sometimes be spread out over months, because when I’m making an album, I take turns finishing each track to a certain point and moving to another. This lets me come back with a clear mind. Do you have an instrument of preference to start from? Piano, definitely. Piano can express the lowest and highest tones. I love to make piano versions first, or a piano loop, and build the song either around it or out of its different pieces (for example, the left-hand bass melody of a piano track becoming the bass line of the final track). Adult Swim bumps especially circa 2004 were such an important musical influence on so many people, and you’ve got a few albums dedicated to recapturing that feeling. What about those bumps meant so much to you? Why do you think they have such lasting resonance? Adult Swim as a whole was such a magical experience that really felt like some sort of renegade broadcast showing media only for you, especially in those years. The bumps at that time were designed by two employees (I believe it was Jacob Escobedo and Michael Cahill) and the best ones are like moving posters for strange locales or events with quirky characters and Japanese lettering. They were unexplained but very intriguing. They stuck in your mind just as much as the shows around them. The music scoring all the bumps was either funky electronics sourced from production music libraries or hip-hop beats sourced from local Atlanta artists and Rhymesayers label artists, and it was all underground enough that it blew my mind and opened me up to a world of beats. The bumps are inseparable in my mind from anime like Cowboy Bebop, Samurai Champloo and Trigun, memorable shows which all had their own great signature music I still enjoy. It was just a perfect fit. What was your process for soundtracking Read Only Memories? How do you do a retro yet futuristic queer noir? What kind of feedback did you have with the team? I started off scoring the game with something between funky 80s-style electronica and the melodic, poppy anthems of the Persona game soundtracks. It was hit and miss, but eventually, with guidance from director John James, I settled on a poppy, retro style incorporating mostly the sounds of the Yamaha DX-7 synthesizer (a version of which is in the Sega Genesis) and I paid tribute to everything from PC adventure games to Genesis classics to 80s anime to Blade Runner (my main inspiration when I think cyberpunk music and sci-fi noir). The team was very close, collaborating together in a Slack and sharing drafts of everything as it was completed, so once I had found the sound the director was looking for, I knew immediately. Your latest release is a tribute to the sound and the vibe of Jet Set Radio games. How do you capture that in wholly original songs? I was working in the same vibe already for a score for the fighting game Cerebrawl, but I wanted to take that style to a complete project separate from that game’s music, as it would not be finished for some time. I was encouraged to turn it into a Jet Set Radio tribute album by that game series’ fan community and several other fans after sharing the idea and a draft of one track. I began throwing some already finished songs in and making it work, using prototyped but aimless rap tracks like “24 Hour Party People” and “Say Somethin” as the genre shifts that the Jet Set Radio soundtracks are also known for. I basically focused on the signature sounds of Jet Set – loud dry horns, extremely funky guitars, slapping bass lines and almost nonsensical repeating vocals. It is very fun to make music with this energy, and I just took those sounds and ran with it, staying away from listening to the games’ soundtracks too much while creating it. I just used my lasting memory of what Jet Set sounds like, and I think that worked. You’ve called this Jet Set project the most “you” project you’ve ever done, and claim that you started thinking about this more than ten years ago. What makes this so special? As much as I favor making calming, more low-key music overall, I’ve always really wanted to make an energetic, positive album that people could come back to again and again for inspiration and excitement. Just one, but I could never get out of my own head about what it would actually be, for ten years. Every computer I’ve owned had three or four different versions of this album on it, including the one I’m currently typing on. I guess a lot of artists just have that one idea they really want to deliver on, and it’s very satisfying to finally do it and know that it is having the result you wanted. People seem to easily be enjoying this much more than anything I’ve made, and I am, too. It is so “me” because it shows a lot of sides of myself that I’ve rarely gotten to express, in vocals, in ferocious energy, in frantic change-ups. However, I also think it’s very sweet, genuine and affirming and I get that “baring my soul” feeling in a way that makes that saying a lot less cliche. Walk me through my favorite track, “24 Hour Party People.” How did you do a party track about preferring to communicate with people over email? Well, the funny thing is that when I was first developing the beat, I thought it would have to be for a party/club track (even though anything with a beat this antiquated has no chance in the clubs in 2018 anyway), but I have increasing distaste for going out these days. I decided, instead, that it would be far more interesting to write a song about NOT going out with the same braggadocio and energy that a song about going out would have. The ability to at least understand my introverted side is a deal breaker for me in relationships, and it’s hard to find another person that likes just the right amount of going out. It’s also exhausting to do the amount of being out that is expected of an artist, but the secret I wouldn’t share in the song is that once I’m on stage, I actually really enjoy it. I’m also really fond of this song because it was a work-in-progress for a long time, and now that it’s finally out, I enjoy all the different vocal parts I was able to get in there. What’s your dream TV/film project? Being the sound person for a good horror anthology TV series or movie would be cool. Getting to work with all these different directors that cycled through and being able to create the sound for a different horror universe each week/segment would be wonderful. Also, I’d work on the first-ever good horror anthology. I have had a couple of night gigs at points, and even a single night shift can apparently alter your brain chemistry for up to six months. Do you have different styles of music that come with different sleep schedules? What are you drawn to in the daytime vs at night? Late at night, it’s usually very quiet and hopefully very peaceful. During these times, I like to work on creating just the softest sounds possible, whereas during the day, things are bright, people are moving, and everything might be too distracting to make softer sounds. It’s hard to explain, but at night, when nothing’s going to bother you, working on music and sound can be like a meditation. You can get way closer to the music when there’s less street noise, you don’t have e-mails coming in, you’re not checking for notifications, you don’t have any conversations open with anyone. If I had more control over my sleep schedule, I might even take on different schedules for different types of projects. Finally, what’s your favorite place to take a night walk? I would love to walk through Tokyo or Osaka every night, but since that’s not an option, I’d definitely have to say that it’s a park in my city with a two-mile loop that goes by a small pond, through trees, over bridges, past apartments – just a great variety of views over a long distance. I like to listen to entire albums as I walk it and I try to do so a few times a week.